12-13-14 Operation North Pole — An EXTREMELY MAGICAL experience!!! 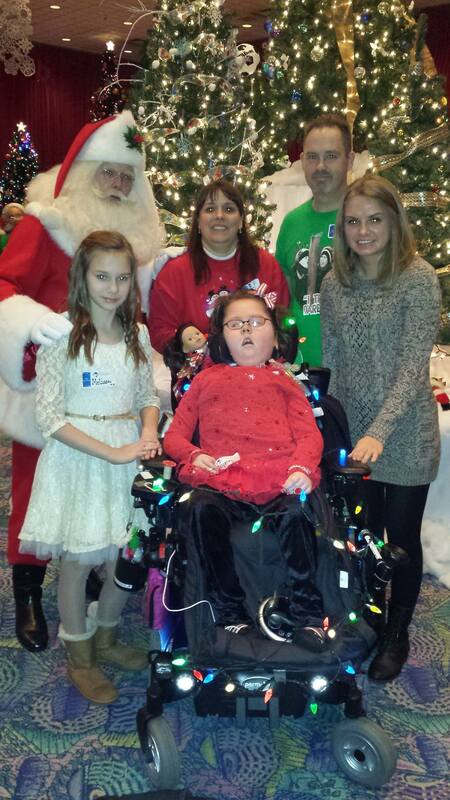 Our family was one of 62 families with a medically fragile child to participate in Operation North Pole. It was one of the most MAGICAL days we have EVER had!!! We started at the Rosemont Convention Center with a full breakfast. Then we took a bus ride to the DesPlaines train station with all the roads closed off along the way. 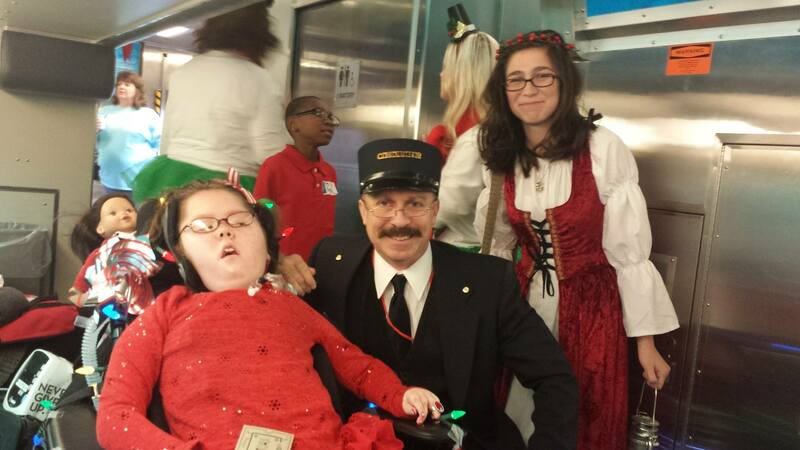 Our train ride to the “North Pole” was INCREDIBLE with lots of surprises, small gifts and carolers (including girl scout troops) along the train route. We then took another bus ride to the Santa’s workshop/center with all rodes closed off again. When we arrived we walked through a tunnel of over 100 volunteer fire-fighters ALL volunteering their time, on their knees, and clapping for Ally and our family (many tears flowing). Inside were MANY, MANY more volunteers and magical things and people (Santa, Mrs. 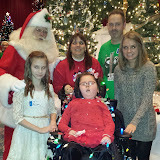 Clause, The Grinch, Elsa, Minnie Mouse, Mickey Mouse, Olaf, dancers, elves, Rainbow service dogs, therapy ponies, HUGE candy wonderland, sundae bar, beauty salon, miniature train set, food……… soooo much…) I cried happy tears throughout the day that our family and my girls were blessed by the kindness of sooooooooooooo many others. 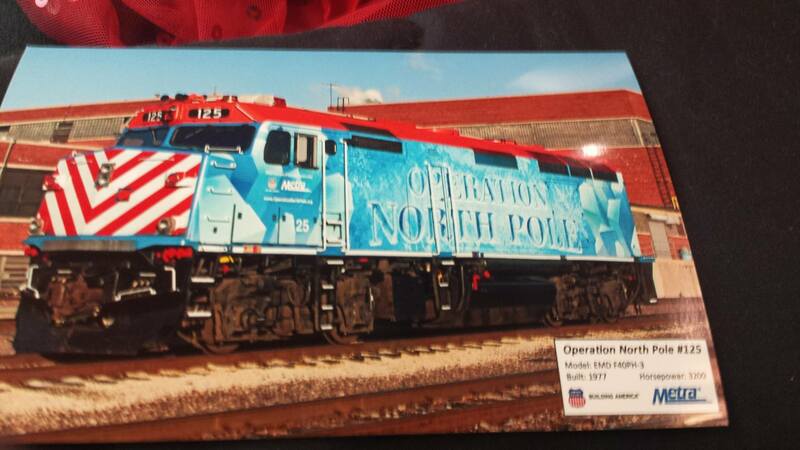 An extra special thank you to to Barb (Lutheran General ER secretary) and Tim — the founders of Operation North Pole. The day ended with bags of gifts to bring home for the younger girls….. which were INCREDIBLE, but the magical memories are the most important!!! I hope me and the older girls can volunteer in future years to help others benefit from this once in a lifetime experience. Hope you enjoy our pictures!!! December 9th was an INCREDIBLE evening!! Ally who is almost 9 years old and has Spinal Muscular Atrophy Type 1 did something brave and caring (for the second time in her life). 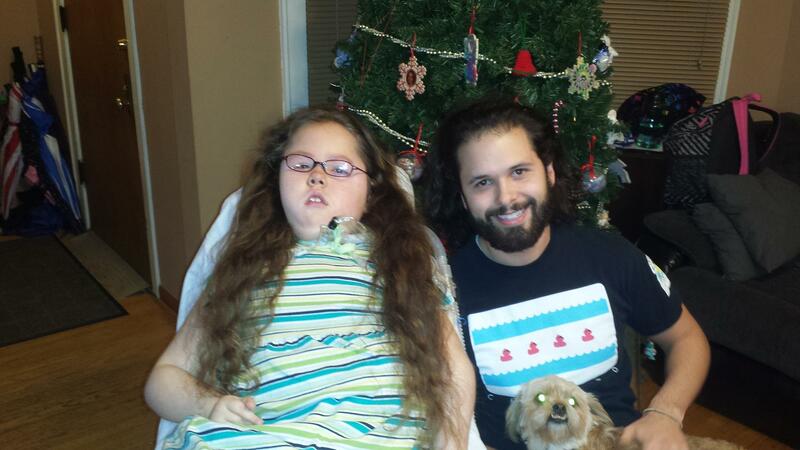 Ally and her homebound teacher from Beard Elementary School in Chicago, Chis Meglan, grew their hair for quite a LONG time with plans to cut it together and donate to “Children With Hair Loss.” We are blessed that Ally is still with us today (since many children with SMA type 1 do not live to see their first or second birthday) and so it is important for Ally and our family to help others when we can too. Chris who teaches autistic children at Beard and teaches Ally some afternoons in our home (on days she cannot attend her school at New Horizon Center due to medical complications) is also a very caring, selfless man who is often doing charity work and helping others. 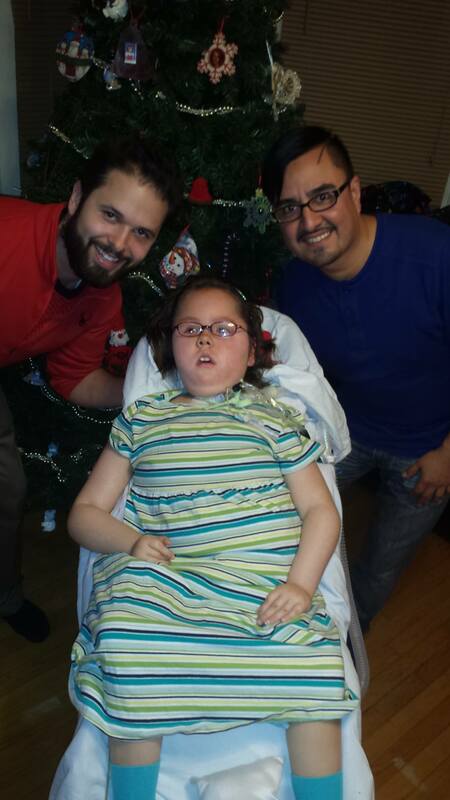 We were very lucky to have Jose Luis from Luis Hair Design (3636 W. Fullerton, Chicago – 773-278-3060) come to our home and donate his time for this worthy cause and cut Ally’s and Chris’s hair. Jose Luis is a parent of a student at Beard School and also a caring, generous man to do this for free and be flexible in coming to our home. 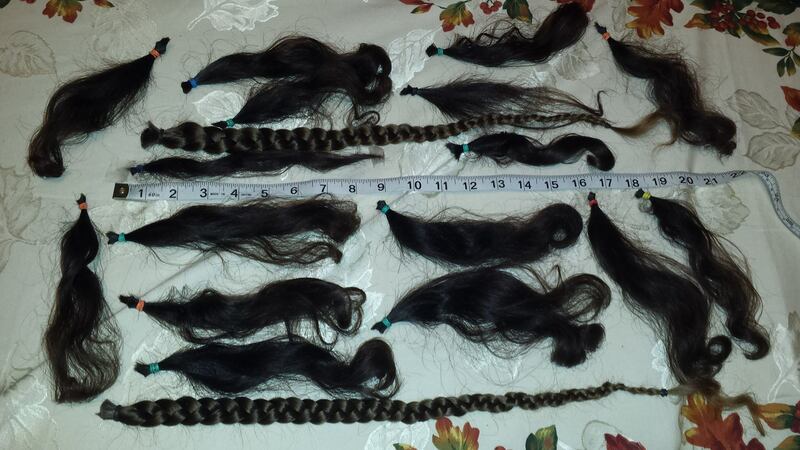 Ally is donating TWO – 20 inch braids and Chris is donating SIXTEEN – 9 in pony tails to “Children With Hair Loss” who makes wigs for FREE for children who have lost their hair for all different medical reasons. Their motto is “Covering Young Heads to Heal Young Hearts”. In addition to the hair, a monetary donation is being made to help with the cost of making the wigs from Chris. 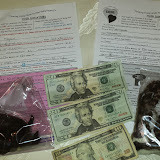 If you would like to make a hair or monetary donation, please go to www.ChildrenWithHairLoss.us. We are hoping we can maybe get someone to do a news story of this act of kindness and also to spread awareness for “Children With Hair Loss”. 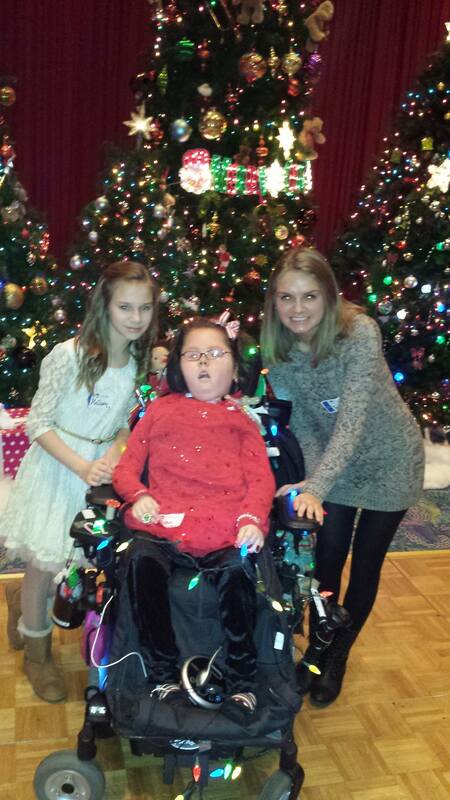 Ally’s mom, Tina Krajewski can be reached at tina@angelally.com. 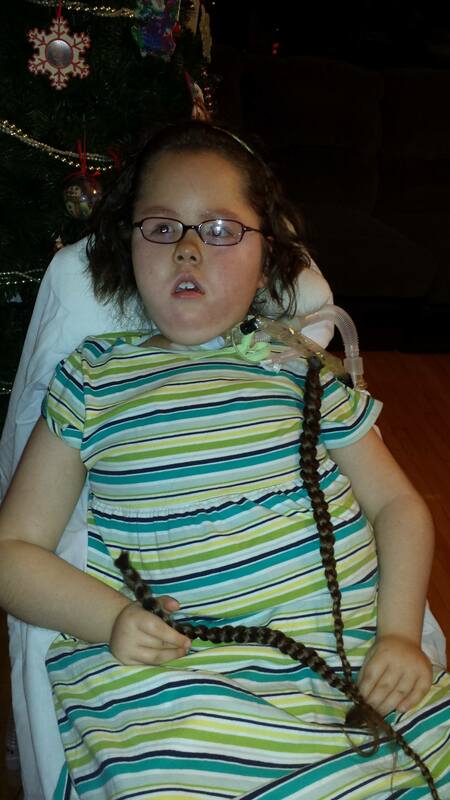 To learn more about Ally and her journey with SMA, visit her blog at www.angelally.com. 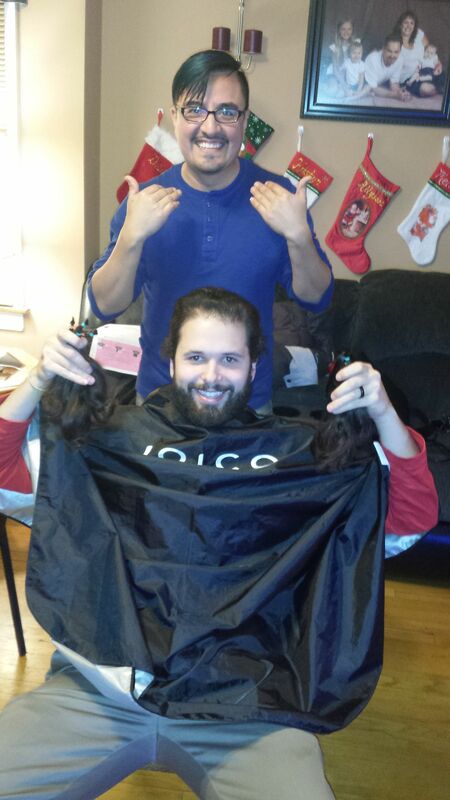 Hope you enjoy the pictures of our hair cutting session. Click the picture/link below to see ALL the pics!! !